A lucky cosmic alignment will allow NASA's Cassinispacecraft to swing up close to two of Saturn's moons back-to-back this week. 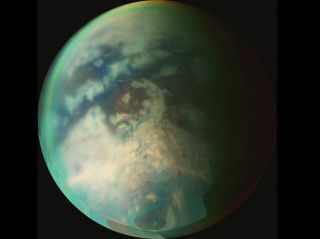 The probe is scheduled to make a flyby of Titan, Saturn'slargest moon, on Monday. Then in the early hours of Wednesday Cassini will makea close approach to the medium-sized icymoon Dione. The special alignment of the moons at this time meansthat the spacecraft should not have to make any maneuvers in between to adjustcourse. The Titan flyby will take Cassini to within about 4,700miles (7,500 kilometers) of the moon's surface. Though the craft has beencloser on past swings near this intriguing body, this time the slightly widerview will allow Cassini's cameras to stare at Titan'shaze-shrouded surface for a longer time. Scientists hope the probewill be able to capture high-resolution pictures of two dark regions around theequator, called Belet and Senkyo, that appear to ripple with sand dunes. On Wednesday Cassini will make its closest approach everto Dione, plunging to within about 300 miles (500 km) of the moon's surface. Itwill be the spacecraft's second flyby of this moon, which is less famous thanits siblings Titan and ice-covered Enceladus. Based on the first Cassini flyby of Dione in October2005, and data taken earlier by the Voyager spacecraft, scientists think themoon could be sending out wisps of charged particles into the magnetic fieldaround Saturn and potentially exhaling a diffuse plume that contributes materialto one of the planet's rings. Dione wouldn't be the only Saturnian moon with a plume:Enceladus is famous for its geysers full of water vapor that shoot off thesurface. But Dione's plume would likely be subtler and produce less materialthan those on Enceladus, which have been dubbed "ColdFaithful." Cassini will use onboard instruments that measuremagnetic fields and mass, electrical charges and densities of atomic particleson Dione to search for signs of activity. The Cassini orbiter was launched in 1997 as part of the Cassini-Huygensmission, a joint project of NASA, the European Space Agency and the ItalianSpace Agency. Cassini arrived at Saturn in 2004, and was slated fordecommissioning in September of this year, but was recently granted a lifeextension through 2017. CanLife on Titan Thrive Without Water?